The shoulder girdle or pectoral girdle is the set of bones in the appendicular skeleton which connects to the arm on each side. 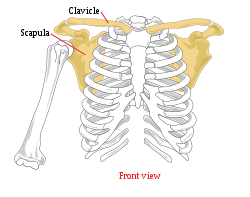 In humans it consists of the clavicle and scapula; in those species with three bones in the shoulder, it consists of the clavicle, scapula, and coracoid. Some mammalian species (such as the dog and the horse) have only the scapula. The pectoral girdles are to the upper limbs as the pelvic girdle is to the lower limbs; the girdles are the parts of the appendicular skeleton that anchor the appendages to the axial skeleton. In humans, the only true anatomical joints between the shoulder girdle and the axial skeleton are the sternoclavicular joints on each side. No anatomical joint exists between each scapula and the rib cage; instead the muscular connection or physiological joint between the two permits great mobility of the shoulder girdle compared to the compact pelvic girdle; because the upper limb is not usually involved in weight bearing, its stability has been sacrificed in exchange for greater mobility. In those species having only the scapula, no joint exists between the forelimb and the thorax, the only attachment being muscular. The shoulder girdle is the anatomical mechanism that allows for all upper arm and shoulder movement in humans. The shoulder girdle consists of five muscles that attach to the clavicle and scapula and allow for the motion of the sternoclavicular joint (connection between sternum and clavicle) and acromioclavicular joint (connection between clavicle and scapula). The five muscles that comprise the function of the shoulder girdle are the trapezius muscle (upper, middle, and lower), levator scapulae muscle, rhomboid muscles (major and minor), serratus anterior muscle, and pectoralis minor muscle. The glenohumeral joint is the articulation between the head of the humerus and the glenoid cavity of the scapula. It is a ball and socket type of synovial joint with three rotatory and three translatory degree of freedom. The glenohumeral joint allows for adduction, abduction, medial and lateral rotation, flexion and extension of the arm. The acromioclavicular joint is the articulation between the acromion process of the scapula and the lateral end of the clavicle. It is a plane type of synovial joint. The acromion of the scapula rotates on the acromial end of the clavicle. The sternoclavicular joint is the articulation of the manubrium of the sternum and the first costal cartilage with the medial end of the clavicle. It is a saddle type of synovial joint but functions as a plane joint. The sternoclavicular joint accommodates a wide range of scapula movements and can be raised to a 60° angle. The scapulocostal joint (also known as the scapulothoracic joint) is a physiological joint formed by an articulation of the anterior scapula and the posterior thoracic rib cage. It is musculotendinous in nature and is formed predominantly by the trapezius, rhomboids and serratus anterior muscles. The pectoralis minor also plays a role in its movements. The gliding movements at the scapulocostal joint are elevation, depression, retraction, protraction and superior and inferior rotation of the scapula. Disorders of the scapulocostal joint are not very common and usually restricted to snapping scapula. The suprahumeral joint (also known as the subacromial joint) is a physiological joint formed by an articulation of the coracoacromial ligament and the head of the humerus. It is formed by the gap between the humerus and the acromion process of the scapula. This space is filled mostly by the subacromial bursa and the tendon of supraspinatus. This joint plays a role during complex movements while the arm is fully flexed at the glenohumeral joint, such as changing a lightbulb, or painting a ceiling. Shoulders are a common place for tissue injuries, especially if the person plays overhead sports such as tennis, volleyball, baseball, swimming, etc. According to Bahr’s major injury related statistics, shoulder dislocations or subluxations account for 4% of injuries in adults ages 20–30 and 20% of shoulder injuries are fractures. Damage to the shoulder and adjacent features can fluctuate in severity depending on the person’s age, sport, position, recurring shoulder dysfunction, and many other factors. Some other common shoulder injuries are fractures to any shoulder girdle bones i.e. clavicle, ligamentous sprains such as AC joint or GH ligaments, rotator cuff injuries, different labral tears, and other acute or chronic conditions related to shoulder anatomy. Shoulder girdle pain can be acute or chronic and be due to a number of causes. Inflammation or injury of associated tendons, bone, muscles, nerves, ligaments, and cartilage can all cause pain. Also, past injury compensation, and stress can result in complicated shoulder pain. A Winged Scapula occurs for different reasons the two main reasons: palsy of the serratus anterior caused by a lesion on the Long Thoracic Nerve which is the more common or a lesion on the Spinal accessory nerve causing palsy in the trapezius muscle. These lesions can be caused by major trauma to the nerve, surgical procedure complication, as well as from under use of the serratus anterior or trapezius. The occurrence of this can be Unilateral or Bilateral both scapulae do not have to both be affected. As mentioned it is caused by a lesion on the long thoracic nerve this leads to a weakening of the serratus anterior on the medial border of the scapula. This separates Long thoracic nerve from spinal accessory nerve lesions. Major Cause is a lesion on the Spinal Accessory Nerve this palsy presents differently than a lesion to the LTN. The issues caused in the trapezius show as a more mild detachment of the medial border of the scapula and a slide laterally away from the thoracic vertebrate. The shoulder girdle of various hyperoliid frogs: Phlyctimantis verrucosus, Cryptothylax greshoffii, Leptopelis calcaratus, Leptopelis anchietae, Leptopelis aubryi and Leptopelis brevirostris. The shoulder girdle demonstrates an enormous variation in amniotes (animals adapted to a terrestrial life), both among extant species and along evolutionary lines, and determining homologies for individual pectoral elements is difficult. Except for the sternum, these elements were, however, present in early bony fishes before there were even limbs. In digitless tetrapods the cleithrum, clavicle, and interclavicle are dermal and linked to the caudal part of the head while the humerus articulates with a small scapulocoracoid bone. As the first digits appeared, the pectoral structure lost its direct connection to the head skeleton while the scapulocoracoid grew more prominent and started to face laterally. In more derived tetrapods the dermal part of the girdle was gradually reduced and the scapulocoracoid split into a dorsal scapula and a ventral coracoid. In dinosaurs the main bones of the pectoral girdle were the scapula (shoulder blade) and the coracoid, both of which directly articulated with the clavicle. The clavicle was present in saurischian dinosaurs but largely absent in ornithischian dinosaurs. The place on the scapula where it articulated with the humerus (upper bone of the forelimb) is the called the glenoid. The scapula served as the attachment site for a dinosaur's back and forelimb muscles. Chimpanzees are far better at brachiation than humans. Their clavicles possess a cranially oriented twist on the acromial end, conducive to better force transfer through it - a very important function in arboreal locomotion. Chimpanzee scapulas also possess a considerably larger supraspinous fossa, allowing for a larger supraspinatus muscle. Through the process of evolution, humans have lost the Atlantoclavicularis muscle, originating on the atlas of the vertebral column, and inserting onto the acromial clavicle. This muscle acts to elevate the clavicle. ^ Moezy, A., Sepehrifar, S., Dodaran, M. S. (2014). The effects of scapular stabilization based exercise therapy on pain, posture, flexibility and shoulder mobility in patients with shoulder impingement syndrome: a controlled randomized clinical trial. Medical Journal of the Islamic Republic of Iran (MJIRI) Iran University of Medical Sciences, (Vol 28.87), 1-15. ^ Saladin, K. (2011). Human Anatomy (3rd ed.). New York, NY: McGraw-Hill Companies. ^ Lippert, L. (2011). Clinical Kinesiology and Anatomy (5th ed.). Philadelphia, PA: F. A. Davis Company. ^ a b c d Kapandji, Ibrahim Adalbert (1982). The Physiology of the Joints, Volume One: Upper Limb (5th ed.). New York, N.Y.: Churchill Livingstone. ^ Mitchell, Caroline; et al. (2005). "Shoulder Pain: Diagnosis and Management in Primary Care". BMJ. 331 (7525): 1124–1128. doi:10.1136/bmj.331.7525.1124. PMC 1283277. PMID 16282408. ^ Seror, Paul; Lenglet, Timothee; Nguyen, Christelle; Ouaknine, MichaëL; Lefevre-Colau, Marie Martine (2018-02-24). "Unilateral winged scapula: Clinical and electrodiagnostic experience with 128 cases, with special attention to long thoracic nerve palsy". Muscle & Nerve. 57 (6): 913–920. doi:10.1002/mus.26059. ISSN 0148-639X. PMID 29314072. ^ Bramble, Dennis; Lieberman, Daniel (23 September 2004). "Endurance running and the evolution of Homo". Nature. 432 (7015): 345–352. doi:10.1038/nature03052. PMID 15549097. Retrieved 14 November 2014. Roy, André (June 2009). "Rotator Cuff Disease Clinical Presentation". MedScape.